Petsmart donates stuffed animals Jackson Police patrol cars. On behalf of Jackson Police Chief, Julian Wiser, and the Jackson Police Department, we say "Thank You" to Petsmart. 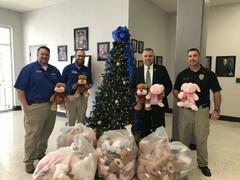 Petsmart donated numerous stuffed animals to the Jackson Police Department to have available in patrol cars. "Sometimes, something as simple as, a stuffed animal could make a world of difference in a young childs life." "We are always grateful when others in the community partner with Jackson Police to make a difference," said Chief Wiser. It is partnerships such as this that make this community successful. Petsmart, your donation can and will make a difference in some childs life.